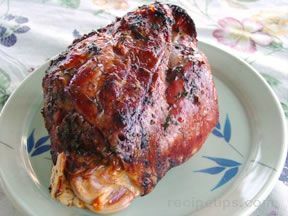 Roast leg of lamb, an easy and festive entree, is often considered only for larger gatherings since it will typically serve 8 to 10. A simple way to turn this into a meal suitable for 4 or 5 diners is to have your butcher cut a whole leg in half - or do it yourself: a hacksaw with a clean blade makes this an easy task with either fresh or frozen meat. If cutting a frozen leg, don't thaw it. Rewrap the unused half and return it to the freezer. Trim excess fat and silverskin from the meat. Press or mash the garlic and mix to a paste with soy sauce, mustard and olive oil. Pat this mix over the meat. At this point, it can stand for several hours or be roasted immediately. However, make sure the meat is completely thawed and has reached room temperature before putting it into the oven. Such a small roast may cook unevenly if the interior is too cold when roasting begins. 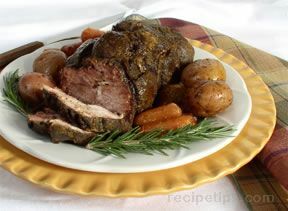 Put lamb on a rack in a shallow baking pan or dish and roast until a meat thermometer reads 140 - 145. Figure on 1 to 1 1/2 hours, but begin checking at 1 hour. Actual cooking time will depend on the size, shape and temperature of the meat and the accuracy of your oven. Remove from oven and cover loosely with foil. 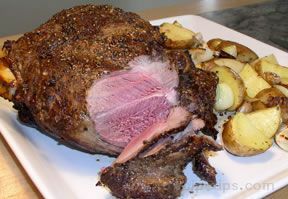 Allow the meat to rest for 10 minutes so the juices can redistribute. Carve and serve, using any pan juices as a pour-over sauce. 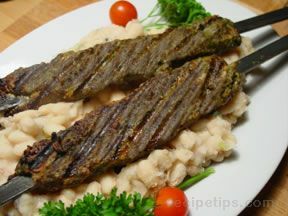 Tip: Warming both the serving plate and the diners' plates will help to keep the meat an ideal eating temperature.